I Buy Way Too Many Records Dot Com: V/A - A Tribute To Broccoli - R.S.V.P. If there is a band that deserves a tribute album, in my eyes, it's Broccoli. In addition to being one of my favorite bands of all time, I also think they are wildly overlooked and under appreciated considering their phenomenal output. While they were only a band for a short while, they amassed a pile of singles, a pair of albums and some of the best songs I've ever heard. 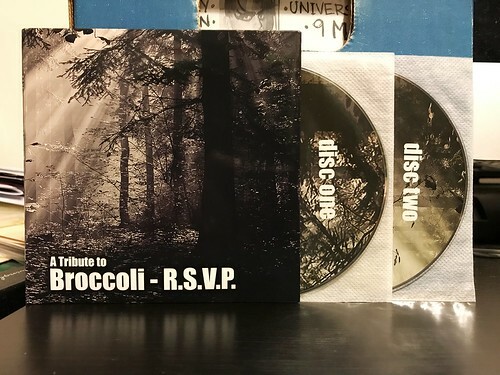 This double CD tribute album is boasting thirty eight bands, all providing their take on a classic Broccoli track. Bands from all over the world take part, but Broccoli's influence seems to have been felt most keenly in the UK and Japan. It would take a long time to point out every cool band and every cool cover, but I'll try to quickly go over a few. Hyalin does a great version of "Constance." The Corpse's take on "Chestnut Road," a song always in contention for my favorite Broccoli song, is faithful, but still manages to tread new ground. The Hum Hums do a version of "I Am A Robot" that is pretty spectacular. Though another band doing the same song, Honcho Tiros, is probably the most interesting take on a Broccoli song as they really put their own stamp on it and transform it into something completely new. I do wish the vocals were just a little louder in the mix, but it is still a highlight of the compilation. Egotrunk do the song "Short Straw Fate," The No Marks tackle "R.S.V.P." and Bows turn in "Constance." The band Chestnut Road (named after a Broccoli song) don't cover the song their band is named after, they do "Fido." The band Short Straw Fate (also named after a Broccoli song) don't cover the song "Short Straw Fate," they do a great version of "Jamaica Street." And the funniest one to me is Water Closet's cover of "Da-a-a-ance," which isn't even a Broccoli song. That one was a Lambrettas song that Broccoli covered on a 7". A band covering a band covering a band, but it's still a solid version of the song. Now, I have to say that you really should own the original Broccoli albums these songs came from. Their second LP Home is probably the best place to start. But I think that this tribute compilation could be an interesting way to discover these songs, particularly if you're already familiar with some of the incredible bands that took part in this project. There's no place online to stream the entire compilation that I can find, trust me. It's definitely worth a listen.